I had a really good yard sale shopping weekend last week. Sometimes you only find a few things, sometimes you find things specifically on your list and lots of them. I have actually been doing more shopping at individual yard sales this year than I ever have. And although I LOVE my parking lot yard sale, the last few weeks I haven’t found as much there. I stopped in a really nice neighborhood at a yard sale and she had great prices! I found more pillows! Yay! The yellow pillow was $1.00, the white ones were $2.00 and in perfect condition. Once I got home I realized they were from Pier One and they have really nice zippered covers. I think I might stencil, paint, or embellish them somehow. She also had this gorgeous chandelier! It had a price tag of $15 on it but I offered $10 and she said yes. I have been looking for a nice BIG chandelier to put in my stairwell. Now to just get my electrician brother to come help me install it since the stairwell is 2 stories well. Excited that I don’t have to spray paint or do anything to this fixture either. I also picked up a grapevine wreath for $1.00. Can always use more of these. This week I actually did find quite a few things at my parking lot yard sale too. These 2 baskets were 50¢ each. I had looked at one at a yard sale on Friday for $1.00 and almost bought it. Glad I didn’t – and I got a 2/$1.00 deal! My favorite 25¢ sellers were back and were having a 10/$1.00 sale! I got a nice new fall towel and 2 BHG leaf placemats for 10¢ each. And picked up a few more pieces of jewelry from my new jewelry guy for $1.00 each. I plan to start collecting jewelry now for Christmas presents. Hoping for a good weekend this weekend too! So what did YOU find? I loved looking through your linkups from last week. Cheryl from “The Creative Me and My McG” got some great deals! 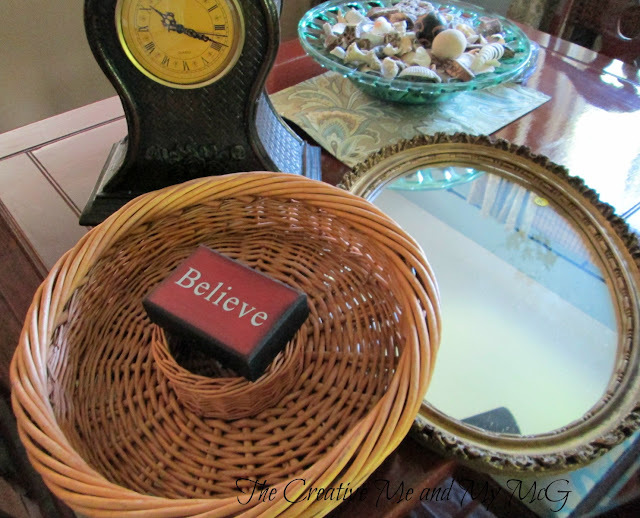 Love the mirror, tray and clock! Renee from Living, Laughing, and Loving found some oversized metal silverware in a thrift store, spray painted them, and added them to her kitchen in her new house! A set of those are on my list too. 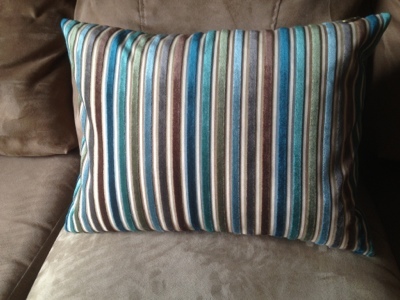 Leslie from Flower Gloves and Rubber Boots found a pretty pillow at a yard sale for $1.00 and guess where it was from – Pier One! So now it is YOUR turn! I want to see what you found. Love the shape of those baskets! And your jewelry guy makes me jealous. I have like zero jewelry. Going on a date to Value Village tonight, though, so I’m looking forward to what I might find! Thanks, Renee! I’ve never been there – will have to check it out! I have been finding tons of stuff at GW since we moved! It’s crazy!! Thanks for featuring my finds from last week! I have linked up my yard sale finds from last week too! I love this party! PS – Love that chandelier! – I picked up one of those last week too! If you are interested in grapevine wreaths please e-mail me. I have quite a lot my mom made when she used to teach basket weaving. I’m looking for good homes. i am so so jealous! You find some really awesome deals. I love that chandelier it is absolutely GORGEOUSS!! Just found your blog via Pinterest. My deck is really in need of a good cleaning, so I appreciate the tips for products that work with ease! I would use a Lowe’s gift card to get some cushions for my deck chairs. Looking forward to reading your blog now that I’ve discovered it! What I meant to say here was that I love that chandelier! That was a great find at a great price! We are avid yard-salers/thrifters, and are always amazed at the things we find, often meeting a need – or even just a want – at so little cost! Looking forward to this regular feature on your blog! Leslie Marie recently posted..Are You Feeling Lucky Punk?